Thursday, March 15, Sir Elton John showed 10,363 people in Roanoke that he truly still is one of the greatest rock pianists of all time. With a four-decade career that is still going strong, John is releasing his 31st studio album this fall called The Diving Board. In an interview with Rolling Stone magazine this week, John said, “I’m as psyched about it as I was with The Union. As I said with The Union, I had to go back to go forward, and it’s the same with this record.” John’s statement proves that the past doesn’t always have to be left behind. John’s musical journey through life started at the age of three when he began to play piano. As a teenager, with the help of his mother and stepfather, he played piano for a local pub on the weekends. He worked for a music publishing company by day and at night, and spent time doing solo gigs at a London hotel bar or performing with Bluesology, a band he had formed with his friends. While John experienced some success with Bluesology, it wasn’t something that would set him on the path to stardom. Bernie Taupin is someone most of John’s fans are familiar with. Taupin is an English lyricist who has written the lyrics for a majority of John’s songs. The pair met quite accidentally. They both answered an advertisement put out by Ray Williams, who was then the A&R manager for Liberty Records. While neither of them passed the audition for the record company, Williams put both artists in contact with each other after recognizing their talent. Taupin would write lyrics in an hour and John would put music to it in only 30 minutes. They both worked flawlessly together. This introduction would lead to a long road of collaborations. While John’s career is still moving along, the John from the 70s played a whole different ball game. One of John’s most overlooked albums is Madman Across the Water, his fourth studio album released in November of 1971. At a running time of about 45 minutes, Madman is usually known for producing two of John’s greatest hits, “Tiny Dancer” and “Levon.” The lack of attention received by fans may be due to the fact that this was John’s fifth album released in 18 months, between April 1970 and October 1971. Some might call this overkill but for die-hard fans, this was a gift. Madman has been praised for showing a different, more serious side of John. This album kicks off with a track that has come a long way. “Tiny Dancer” was written by Taupin as an ode to his wife. Aside from Taupin’s captivating lyrics, the most outstanding part of the song is the chorus filled with John’s falsetto. “Tiny Dancer” was not initially a hit. It only reached No. 41 on the U.S. pop chart, but with time, it became a fan-favorite. Most young adults associate this song with Cameron Crowe’s “Almost Famous” and the famous tour bus scene. It’s an anthem, for sure. “Levon” is the next track, and it’s a perfect follow-up to the previous track. John’s vocals could be praised, but to be honest, his voice is remarkable throughout the entire album. This track’s a perfect example of Taupin’s often ambiguous writing. But what makes the song as great as it is, is John’s ability to make Taupin’s obscure lyrics come alive through the music. The album kicked off at a strong point and critics like to say that the rest of the album doesn’t live up to the first two tracks but they’re mistaken. A truly one-of-a-kind track within John’s discography, “Razor Face” is one of the stronger tracks on the album. 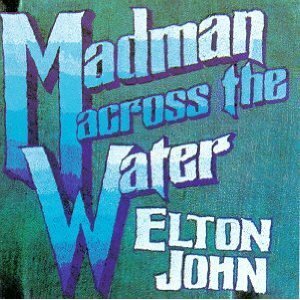 The lyrics are moving and each listener creates a different interpretation of the story behind “Razor Face.” The title-track, “Madman Across The Water,” is a song about lunacy and is, by far, one of Elton’s darkest pieces. Just like all of the other collaborations between John and Taupin, the lyrics are left up to individual interpretation. “Indian Sunset” isn’t the best song, lyrically, but the track’s laid out with heavy strings that cannot be overlooked. The highlight of “Holiday Inn” is Davey Johnstone’s work on the mandolin. Johnstone would become the lead guitarist for John, shortly after being featured on this album. With a mildly groovy tone, “Rotten Peaches” is infectious with its gospel twist throughout the track. Unlike the rest of the album’s lengthy songs, the closing track “Goodbye” is under two minutes and brings it to a good close. It is a perfect example of Taupin’s and John’s epic collaborations. With just John, a piano and some strings on the track, “Goodbye” is almost haunting. Madman Across The Water is the type of album that you have to give a couple of chances. On the first try, you will love one or two songs, but by the second or third listen, you will love it all.